Manufactured in a durable plastic resin, the Keter Scala shed is built to last. This easy to build shed is a durable storage shed with a double wall construction that is fully weather-resistant. It also features double doors for easy access, floor panel, built-in ventilation for safety, two fixed windows for natural light and has a locking system to provide added security for your items. It doesn't really matter. If a thief wants to break into your shed, they will. I think they're more durable. Wood snaps pretty easy, but these are solid plastic. Also stick a motion sensor light on the top corner pointing at the door for extra security. Not available for delivery or collection in the northeast area, or in Oxford. Bought a Keter shed recently from Amazon that was posted on HUKD. Pros: easy to build by 2 persons and plastic will not rot over long term. If built well should not leak. Cons: It is reinforced by very thin aluminium tubing at each corner other than that not very sturdy. Security is non existent-a strong gust of wind opened the double doors on mine even though it had a pad lock on it. OK of you have a secure back garden to keep garden stuff out of the rain. Bought a Keter shed recently from Amazon that was posted on HUKD. 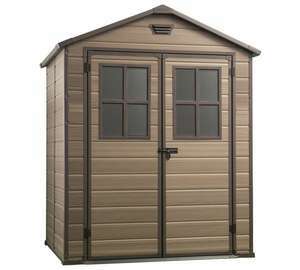 Pros: …Bought a Keter shed recently from Amazon that was posted on HUKD. Pros: easy to build by 2 persons and plastic will not rot over long term. If built well should not leak. Cons: It is reinforced by very thin aluminium tubing at each corner other than that not very sturdy. Security is non existent-a strong gust of wind opened the double doors on mine even though it had a pad lock on it. OK of you have a secure back garden to keep garden stuff out of the rain. I have three keter sheds, two 8 x 6 and a 4 x 3. The doors have stayed shut for 3 years now. Very strange, I must of been lucky getting 3 with doors that shut and fasten shut. Not available for delivery or collection in the northeast area, or in …Not available for delivery or collection in the northeast area, or in Oxford. Seems to me they might deliver in the 50 sq miles from wherever the warehouse is and nowhere else! Poor from Argos being a 'nationwide' company.